We have always had a soft spot in our heart for Black Mountain College. Often thought of as the initial spark for the avant-garde movement in the United States, Black Mountain was formed in 1933 by a quartet of dismissed professors from Rollins College. John Rice, Theodore Dreier, Frederick Georgia, and Ralph Lounsbury believed that education should be an open and nourishing endeavor, not a process of rote learning for specific periods of time during the day. When they tried to implement some of these ideas at Rollins, they were dismissed, Undaunted, they set out to devise their own college -- Black Mountain. In the hills of North Carolina, just outside of Asheville, they gathered artist, writers, musician, architects, photographers, and craftsmen to live and work with the student body. The list is long and accomplished, including Anni and Josef Albers, Ruth Asawa, John Cage, Robert Creeley, Merce Cunningham, Elaine and Willem de Kooning, Buckminster Fuller, Gwendolyn and Jacob Knight Lawrence, Robert Motherwell, Charles Olson, and Robert Rauschenberg. In late 2015, the Institute of Contemporary Art/Boston mounted the largest comprehensive exhibition on Black Mountain College. Helen Molesworth curated the mammoth collection of art, ceramics, textile art, photographs, which was supplemented with dance and music. 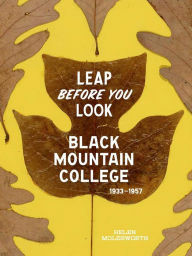 The exhibition closed in January of 2016 but it left behind a wonderful monograph, Leap Before You Look: Black Mountain College 1933-1957. Check out this video for the exhibition. There is still time to catch Leap Before You Look in Los Angeles and later in the the year in Columbus. In the meantime, grab a copy of the monograph, a must for Black Mountain fans.